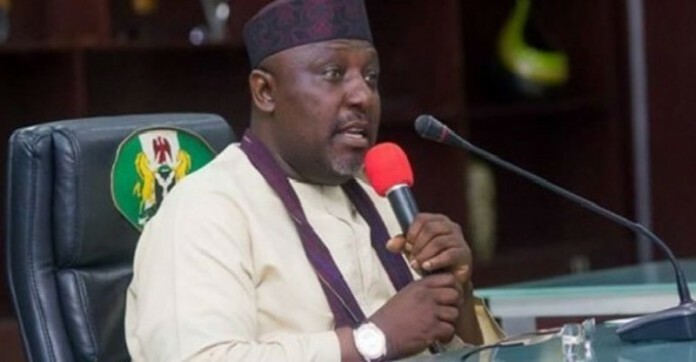 Outgoing Governor of Imo State, Owelle Rochas Okorocha may be in for a hell after leaving office on May 29,2019, if signals coming from the party that produced the winner for the just concluded governorship election, the People’s Democratic Party, PDP are anything to go by. The PDP had earlier in a statement credited to the State Chairman, Chief Charles Ezekwem accused the governor of the mastermind of alleged withdrawing of about #17bn from the state treasury since the election result of the governorship was announced warranting the Governor’s spokesman to issue a response stating that interest of the governor-elect is Imo treasury. In a swift reaction, the PDP through its state Publicity Secretary, Damian Opara in a statement expressed that “we are not surprised that the shamed Governor, in his usual smart-by-half attitude, deliberately avoided the serious issues raised by our party, to rather throw tantrums and engage in name calling. “For emphasis, we insist that, within the last four days, Governor Okorocha has made huge cash withdrawals from banks to the tune of N17billion. And we challenge him to publish the financial status, including a comprehensive statement of account of Imo State, to buttress his defence as that is the only evidence our party and the good people of Imo State will accept as the truth. “Now that Governor Okorocha has shamelessly decided to make mockery of his drowning self, by questioning the capacity, preparedness and astuteness of Rt. Hon. Emeka Ihedioha CON, Governor-elect, Imo State, we will not in any manner, aid his desperate attempt to divert attention from his ongoing last minute looting spree. But we will bring the attention back to the burning issues, bothering on his primitively insatiable thirst for looting of public funds. “But for emphasis, we wish to state that the antecedents, trajectory, accomplishments, pedigree and track record of achievements of the Governor-elect, are well known, to not only Imo people, but to Nigerians in general, which indeed are the reasons he enjoys the respect support and goodwill in the nation, even across party lines. “It is on record that Governor Okorocha was sacked as the Chairman of Nigerian Aviation Management Authority (NAMA) as result of fraud within months of his appointment. His person is known across the nation to be synonymous with fraud. It is only unfortunate that history has recorded such a character as the Governor of Imo State. “Our brand new Governor-elect has never been involved in any fraudulent activity nor being questioned or investigated for any form of abuse of office despite holding very high sensitive offices at the national level. He is known to have acquitted himself creditably, while setting new records and leaving legacies in the sands of history in the nations public service. “Importantly, unlike Okorocha who had neither a well researched programmes and policies for the state nor even basic experience in public service before becoming governor, Rt. Hon. Emeka Ihedioha has prepared himself very well with fundamental experience, multiple capacities, track record and indeed has a well researched manifesto to rebuild Imo State. And we are confident of his outstanding performance as the Chief-Servant of the state. “We wish to inform Governor Okorocha again, that there is no hiding place for him. He must face the music. He must answer for the atrocities he committed and the primitive looting of the state funds he supervised. “We once again challenge Okorocha to publish the finances of the state – bail out fund, FAAC allocation ,LG allocation, 13% derivation, Paris fund, ecological fund, budget support and other funds that accrued to Imo State for 8 years he has been governor. “We challenge him also to publish without delay, names of contractors that did “projects” for the state and how much each “project” cost the state.